We would like to encourage you help circulate the following press release on breaking news regarding the status of Haitian President Jean-Bertrand Aristide, who is being held virtually incommunicado on the instructions of U.S. authorities. We have established an easy-to-use system that will allow you to send the press release to the local and national media of your choice. This system also will allow you to send a brief customized message, if you would like, to the media outlet(s) you choose. By working together around the country, we can encourage and/or pressure the media to pursue this story. 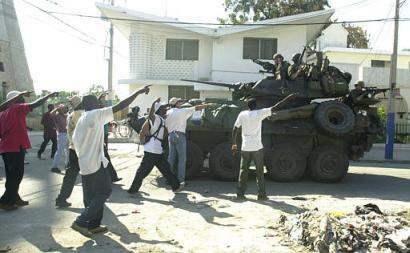 Thousands of people in Haiti have risked life and limb in recent days to demonstrate in Port-au-Prince in support of the return of the democratically elected president of Haiti and in opposition to the U.S. coup d'etat and occupation. Take a few moments to help circulate this press release to show solidarity with the Haitian people. Below is the press release, entitled "Aristide Under Lock & Key, U.S. Delegation Says." Below the press release is the link for the easy-to-use system that allows you to send out this press release to the media outlets of your choice. A delegation from the United States has arrived in the Central African Republic to meet with overthrown Haitian President Jean-Bertrand Aristide. President Aristide was taken involuntarily to the Central African Republic following a U.S. coup d'etat on February 28. The group was granted visas on Thursday and Friday and departed the United States on Friday evening. The delegation includes Kim Ives from the Haiti Support Network, and Johnnie Stevens and Sara Flounders from the International Action Center. Ives, Flounders and Stevens are representing former U.S. Attorney General Ramsey Clark. Also on the delegation are Brian Concannon, acting in the capacity of President Aristide's lawyer; and Katherine Kean, a friend of President Aristide. Kim Ives, a personal friend of Jean-Bertrand and Mildred Aristide, said "This morning, the delegation went to the Palace of the Renaissance, the presidential compound where President Aristide is being held." Mr. Ives had spoken to the Foreign Minister on Thursday to inform him that the delegation was coming to the Central African Republic to meet with President Aristide. "We were stopped at the gates by a guard who contacted a Central African Republic official inside the building. A representative of the Central African Republic came out to speak with us," Ives reported. "We asked to go in to visit President Aristide and were told we could not. We asked if he could come out to see us, and we were told no. We asked if we could send in a note or our phone number, and we were told no. The official then told us that he had spoken with the Minister of Defense and that Aristide was not allowed to receive visitors." Mr. Ives also reported that he placed a call to the cell phone that the Aristides have been using to place calls to their friends, attorneys and the media. "Mildred Aristide answered the phone. I said, 'Hello Mildred, this is Kim Ives, we are here.' At that point, the phone line went dead. We have tried to call many times since then but there has been no answer." Brian Concannon is also a member of the delegation, acting in the capacity of President Aristide's attorney. Standing outside the gates of the compound where President Aristide is being held, Mr. Concannon requested to meet with President Aristide alone for a consultation. This was also denied. "The world has been told that President Aristide is free to come and go, and that he has simply chosen not to leave," said Sara Flounders of the International Action Center. "The fact that our delegation has been denied all forms of contact with President Aristide confirms, in fact, that he is being kept under lock and key, at this point not even able to communicate by phone." "The U.S. and French governments chose to take Aristide to the Central African Republic, a formerly colonized and impoverished country," said Johnnie Stevens of the International Action Center. "The Central African Republic, similar to many formerly colonized countries in Africa and around the world, has been isolated and underdeveloped because of the past policies of France, the U.S. and other colonial and neo-colonial powers. The U.S. and France should be paying reparations to the Central African Republic."